One of the sure signs that I'm evolving into a Brit is checking the weather forecast incessantly before getting dressed. And that I'm constantly apologizing even when I walked into a lamp post. The weather here suffers from more mood swings than I do. And that says a lot if you ask my long suffering husband. You probably wouldn't have guessed that I've got 4 layers on, not including my cashmere shawl. Looking good is secondary to staying warm and dry. The thing is I'm constantly in and out of places which meant I alternated between feeling like I'm roasted alive (like the pork belly in my oven right now) or feeling like I've just stepped into the Arctic. It's far easier to remove a thin layer than one chunky sweater at the moment, at least before there's snowfall. I bought this Topshop military style shirt on a whim and was already making plans for its return before the package even arrived. It turned out to be one of my best buys because the shirt is slouchy and long enough to be layered in autumn or winter and still thin enough to wear on its own during the hotter months. Furthermore, it's flattering and versatile when paired with jeans or printed skirt for a more dressed up look. My heart goes out to those of you who live in the east coast of US and Canada. I hope you're all safe and warm. I cant' begin to imagine what the emotional and financial cost for the clean up would be. Love this styling and the more I see that hat, the more I want it. But I look a bit rubbish in hats unless I tie my hair up and that's just a tad too cold for me to do at the moment but never say never. Glad to see the ankle boots out with the boyfriend jeans - at times like this, I realise I am in good company. And your opening paragraph - I totally relate. It's partly why I love the UK so much - the English have the art of queueing and apologising down to a fine art. This is such a great look for our British weather. I adore your coat too. So beautiful. You look very warm and cozy in this outfit. A hat adds such a special touch . Such a fab look! Those types of shirts are great wardrobe staples! I sometimes fall into the trap of buying too many statement pieces and not enough simple basics. Great job, from one layering fan to another!! 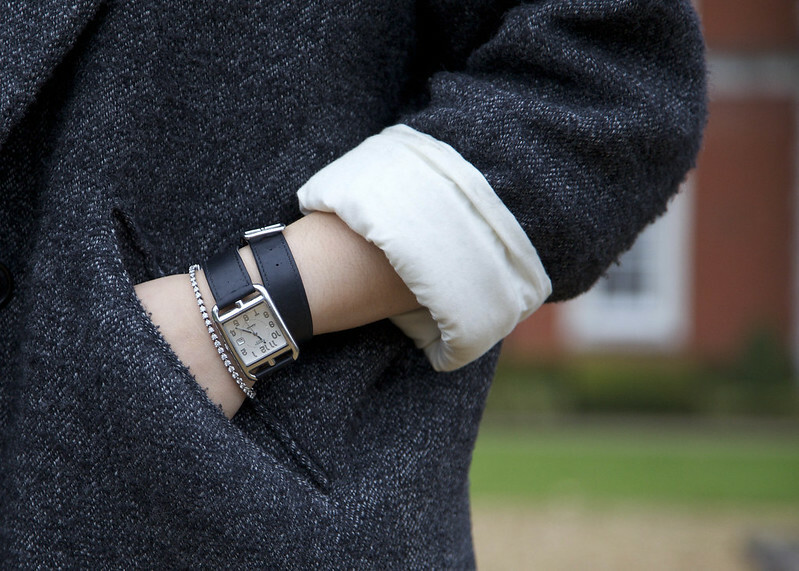 You look perfectly well layered for autumn.Layering is such an art, but you've mastered it! Warmth is always a priority for me because I freeze. My ankles would freeze with the flesh peeking out, but I do love the look. Fantastic outfit!!!! - you look so casual cool, warm chic and an eclectic lot of layers. Love how you have a Hermes bag - love that, its a nicer version of my Marc jacobs!) with the worn boyfriend jeans and jacket. Isn't it funny how sometimes the things you aren't sure about can be your best buys? I recently scored an IM skirt (that wool one Kate bosworth wore) off eBay and remember thinking I hope I don't win the auction. So glad I did as the turned out to be a great purchase. Anyway, you look chic as usual! I was just thinking to myself the I havent seem Miss Gold around on your blog for sometime now.. So happy to see it today! Please tell me if you have another one in your store...lol!! This is one of my fav outfits! That hat is growing on me! Love the scarf and your boyfriend jeans. But that smile alone is just perfect charisma for a positive vibe all day.You look so young and beautiful. 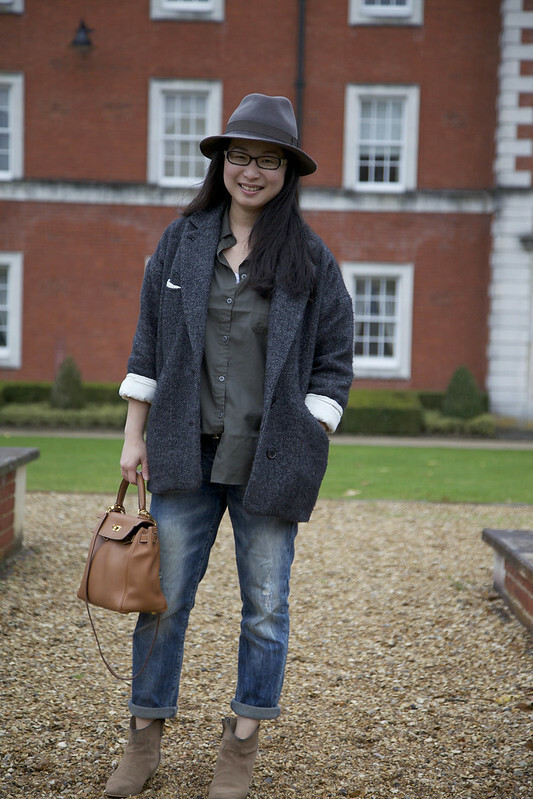 It's time to layer up indeed, love the chic note added with your hat ! You look beautiful and I love very single item you're wearing! omg love all the hermes. you are looking so stunning!!! xO! A love me a good leopard scarf, and you paired it perfectly with this chic coat, pretty lady! your jeans look great! i've been curious about zara jeans. do you like them? I've never liked Zara jeans before but these ones are even better than my 7FAM and J Brand Aidan boyfriend jeans. The fit's flattering and they cost a mere £29.99. I love that you're doing outfit posts now! You look so stylish and I love your coat! What a fantastic outfit! It's so incredibly elegant and cool. I'm ready to copy it come the week-end... Well, hoping it's not too cold and wet!